Trinidad and Tobago Computer Society – "networking local computer users!" hold membership in several international organisations and advise on technology issues in Trinidad and Tobago and the region. We have regular meetings, mailing lists, our website and are on Facebook , Twitter and Google+. We also maintain a collection of Free and Open Source Software for Windows called the TTCS OSSWIN. Anyone interested in computing or the Internet, regardless of the level of their computer experience or the type of hardware or software they use, are welcome to join our announcement mailing list to keep up to date about (and participate in) our activities. Join the TTCS mailing list! Trinidad and Tobago Computer Society Lime [Upcoming TTCS AGM, ICANN Reports, Upcoming CIGF] on **This Wednesday** April 17 2019 from 7 to 9:30 pm; please RSVP! The Trinidad and Tobago Computer Society will be having a lime this Wednesday April 17th, 2019 from 7pm to 9:30 pm at Wendy’s Cafe located upstairs at Wendy’s Restaurant at the corner of Ana Street & Ariapita Avenue, Woodbrook, Port of Spain. Our key topic for this lime is to discuss our upcoming AGM and nominations. We should also be receiving reports from representatives at ICANN and TTMAG. Please come prepared with your comments and contributions to the discussion, especially with regards to our nominations for our AGM. The Internet Corporation for Assigned Names and Numbers (ICANN ) will be having its 64th public meeting from Saturday March 9 to March 14 2019 in Kobe, Japan. However, you can listen in and participate remotely. 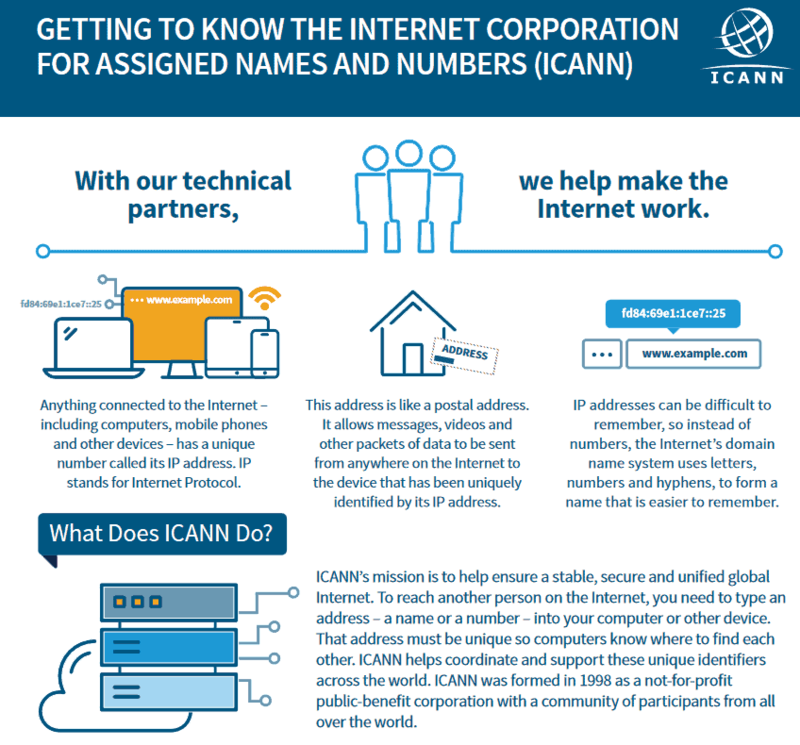 As the name implies, ICANN helps coordinate the assignment and management of Internet numbering resources (such as IP addresses) and domain names (forming a system called the Domain Name System or DNS). The DNS maps domain names to IP addresses. ICANN also defines and implements policies for how the “Names and Numbers” of the Internet are assigned. ICANN coordinates policy development related to the DNS by bringing a variety of stakeholders (ranging from governments, technical, business, civil society) organised in various groups to develop and advise on such DNS policies. 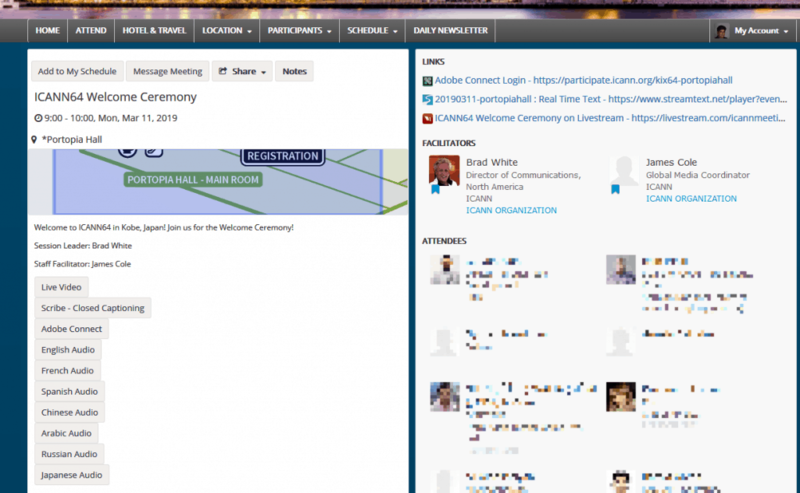 This volunteer-based group of diverse stakeholders is called the ICANN community. The Trinidad and Tobago Computer Society (TTCS) is an member of the ICANN At-Large Community since 2006, which represents the interests of Internet end users in ICANN policies and activities. ICANN64 Full Meeting Schedule – this table (you will have to scroll down a lot) shows the various meetings happening in various rooms at the same time. All times listed are local to Kobe, Japan. The time in Kobe Japan is 13 hours ahead of that of Trinidad and Tobago. So when looking at the ICANN64 schedule, you’ll need to subtract 13 hours to get the time of the meeting in Trinidad and Tobago. This means that the meetings on Monday Morning for example will take place on Sunday night in Trinidad and Tobago. If you visit the schedule on your iOS or Android device, you can install the ICANN Meeting App to follow the schedule on your mobile / tablet device. Or search for “ICANN” in your app stores. At-Large Meeting Agenda Workspace – lists the very busy schedule and detailed agendas of the meetings of the At-Large Community. Pre-ICANN64 Policy Report (PDF) – This report provides a high-level overview of the planned work and activities of the Supporting Organizations and Advisory Committees (including At-Large) at ICANN64. Scribe – Closed Captioning – shows the live transcribed text during the meeting – great when you want to scroll back quickly to catch what was said or you can’t listen to audio. follow presentations and raise their hands in order to make comments. Adobe Connect app is also available on mobile / tablet devices running iOS and Android. Currently, as the TTCS’ At-Large representative (Dev Anand Teelucksingh), I have continued to be involved in various At-Large activities. I do want to encourage anyone with a interest and a desire to learn more about ICANN policy issues and how to get involved, email me at [email protected] and I’ll try my best to help. 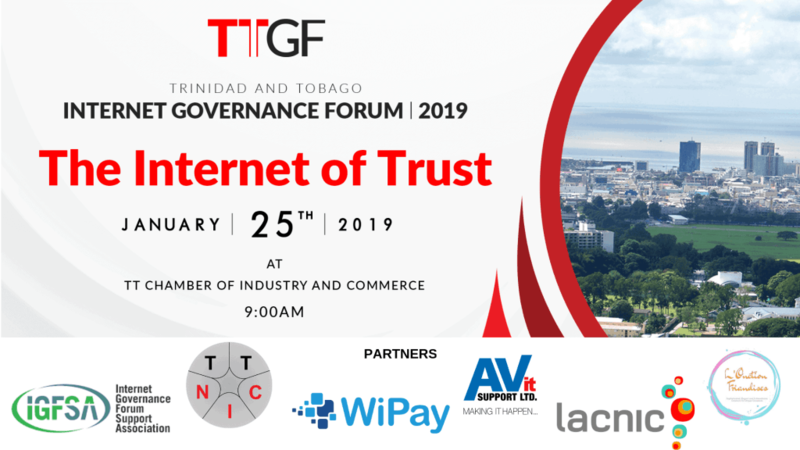 TTIGF 2019 (http://ttigf2019.igf.tt/) will be held on Friday 25th January 2019 from 9am to 5pm at the Trinidad and Tobago Chamber of Industry and Commerce, Columbus Circle, Westmoorings, Trinidad with online participation available for those unable to attend at the venue. Now in its third year, the TTIGF is hosted by the Trinidad and Tobago Multistakeholder Advisory Group (TTMAG), of which the Trinidad and Tobago Computer Society is a member. TTIGF 2019 will also have an open forum session where all stakeholders (including online participants) can share comments, questions, solutions and best practices on internet governance locally, regionally and globally. If you plan to attend (in person or remotely), please register for TTIGF2019 . Registration is FREE. There is no charge to attend TTIGF 2019, but space is limited! 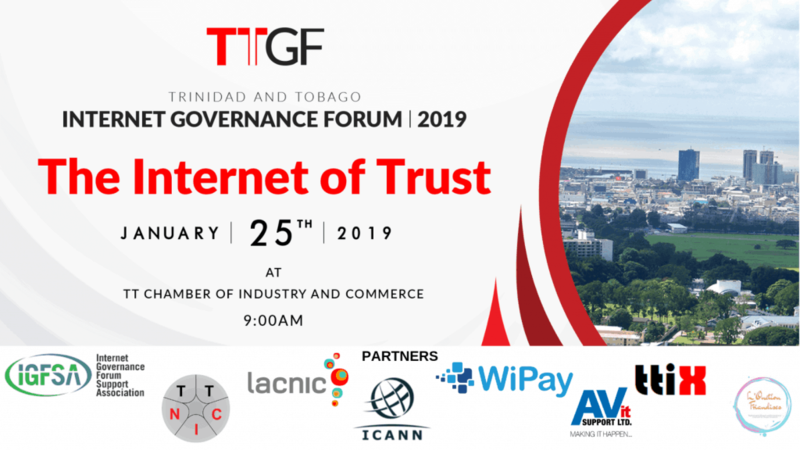 Register for free, to attend the Trinidad and Tobago Internet Governance Forum 2019 (TTIGF 2019) ! The Trinidad and Tobago Computer Society will be having its end of year Christmas dinner at Paprika Bistro at The Falls at Westmall on Thursday December 13 2018 from 6:30pm. Space is limited, so please RSVP at [email protected]! The anticipated cost is $200-$250TT per person. who can Issue E-money” for comments before December 12 2018. Currently, only financial institutions as defined in the FIA and licensed to conduct ‘business of banking’ or ‘business of a financial nature’ (‘licensees’) can issue e-money. E-money instruments include prepaid cards or stored value accounts, digital wallets etc. However, given the emergence of Fintechs3 in the financial landscape, non- licensees have expressed interest in being permitted to issue e-money. The Central Bank is of the view that e-money issuers other than licensees can help promote financial inclusion and development of the domestic payments system which is still heavily cash based. Consequently, it has developed this E-money Policy that discusses the proposed regulatory framework for e-money issuers other than licensees for consultation with its regulated entities and other interested stakeholders. 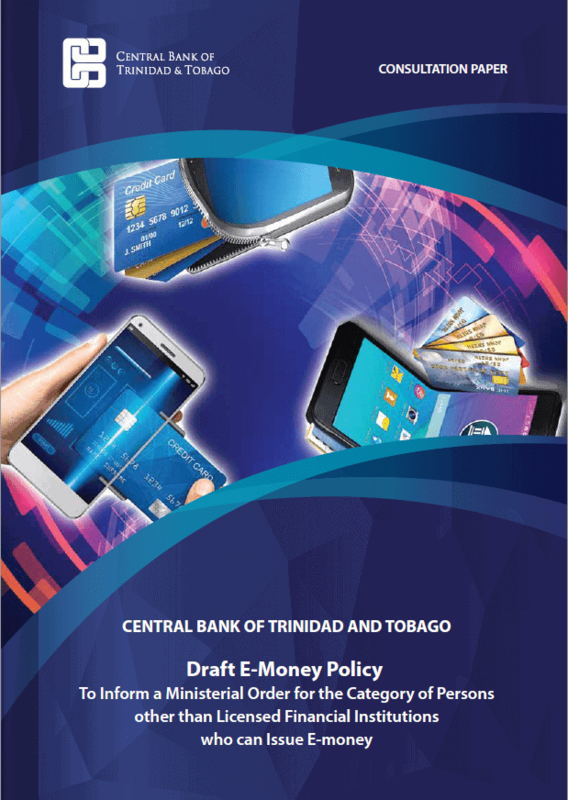 • Part IV presents the policy recommendations for Trinidad and Tobago which are detailed in Appendix 3 – the draft E-Money Issuer Order to be made by the Minister of Finance. 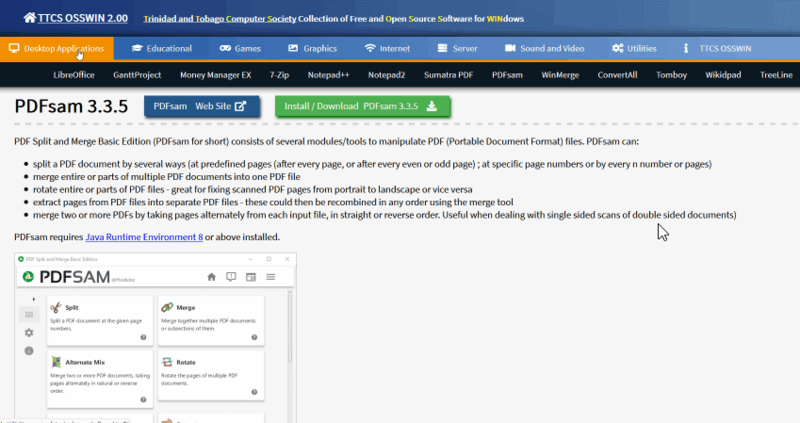 The TTCS OSSWIN v2.40, a collection of the latest version of Free and Open Source Software for Microsoft Windows 10/8/7 is available for download. The latest release features several software updates. The thirteenth Annual Meeting of the Internet Governance Forum (IGF) will be hosted by the Government of France at the headquarters of UNESCO in Paris from 12 to 14 November 2018. The IGF is an opportunity for multi-stakeholder dialogue on public policy issues related to key elements of Internet governance, such as the Internet’s sustainability, robustness, security, stability, access and development. The Trinidad and Tobago Multistakeholder Advisory Group (of which the TTCS is a member) invites you to join us in participating in the IGF at our IGF Remote Hub, which will be based at the Telecommunications Authority of Trinidad and Tobago, #5, Eighth Avenue Extension, off Twelfth Street, Barataria, on Monday 12th – Wednesday 14th November 2018, from 7:30am – 1:00pm. Hold discussions on internet governance issues. Please see the IGF 2018 schedule to identify sessions of interest. Note that the times on the IGF 2018 schedule are local to France which is 5 hours ahead of Trinidad and Tobago. Attendance to the Trinidad and Tobago’s IGF 2018 Remote Hub is free, however please RSVP using this Google Form in order to confirm seating. Light refreshments will be available for participants. The Trinidad and Tobago Computer Society (TTCS) will be having a F2F meeting on Saturday October 13 2018 from 1pm at Engineering Consultants, 112A Edward Street (corner of Oxford and Edward Streets), Port of Spain. At this meeting, we will be working to finish the TTCS’ response (Google doc ; no account required to comment) to the Telecommunications Authority of Trinidad and Tobago’s proposed Internet regulations for Trinidad and Tobago. Please RSVP to [email protected] if you are attending this meeting.